Insert only one memory card at a time into a memory card slot on your product. Make sure the memory card and the files on it are compatible with your product before inserting the card. 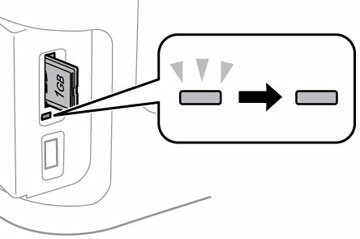 Insert your memory card into the correct slot, making sure the card is oriented correctly. Note: Do not force the card all the way into the slot. Insert it only until it meets resistance. The memory card access light flashes and then stays lit.